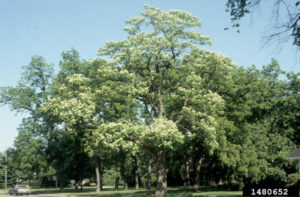 Tall deciduous tree, the Northern Catalpa, naturalized to western states and considered native by USDA, provides rapid to moderate growth rate and can tolerate wide range of soil conditions, including clay soil and waste/disturbed sites and can be found in range from full sun to part shade. While water usage is low, it does do best in moist soils and is tolerant of seasonal flooding. Yellow fall foliage may underwhelm; however, Catalpa more than makes up for it with bell-shaped, orchid type white blossoms in the spring, providing rich bounty for honey bees. Large foliage provides shade and beauty, though is subject to damage from hail, wind and insects. If you are looking for a naturalized native for a problem spot that benefits wildlife and landscape, the Northern Catalpa might be the answer for special needs. Wildlife Notes: Deer tolerant, special value to Honey Bees. Possible Insect Issues: Little to none.